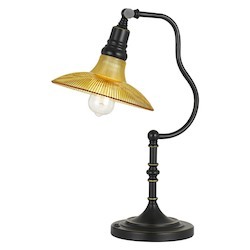 CAL Lighting 60W Waynoka Metal Desk Lamp With Glass Shade. Edison Bulb Included. A premium desk lamp can assist in making your home office or work area brighter so that you can complete your tasks effectively. 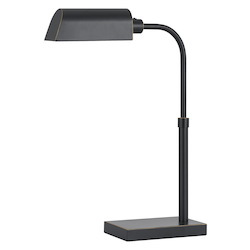 Desk lamps are the ideal solution for students as well since they provide direct light for homework and reading. 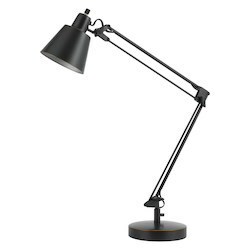 While buying a best desk lamp for studying, it is important to remember that it should not harm your eyes, but at the same time it should cast the required light that is needed to see. 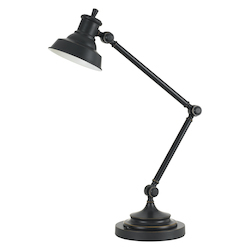 At We Got Lites, you can find a variety of easy and safe-to-use desk lamps that come in many sizes and shapes. On our site, you can buy desk lamps at affordable prices that best fit your work area to finish your job safely, easily and effectively. 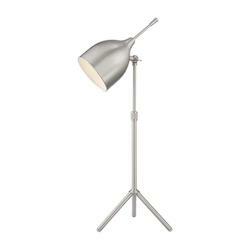 How do the desk lamps from We Got Lites help assist you in performing your job? The desk lamps offered by We Got Lites will assist you to work more productively, efficiently and comfortably by emitting a cool and bright light in your work area. 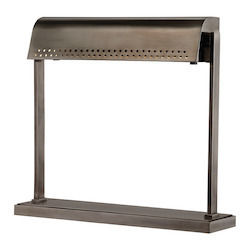 Our task lights come in a variety of styles, such as modern, vintage, contemporary, antique, industrial, rustic and traditional. 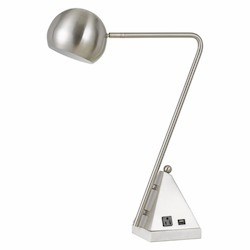 We also offer kids desk lamps and much more, so you find the one to best suit your work setting. 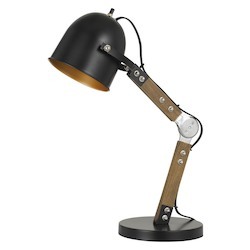 On wegotlites.com, you can choose cute desk reading lamps with a flexible head and arm to direct the light accurately where you require it. All our desk lamps come in both small and large sizes with different types of bulbs such as halogen, fluorescent, LED and incandescent. Each light has been designed with the utmost care so that you will not strain your posture or your eyes, therefore being able to working better. All of our classic desk lights are strong and well made, as they are built of durable and sturdy materials such as metal, brass, glass, plastic, ceramic, crystal, resin and porcelain. 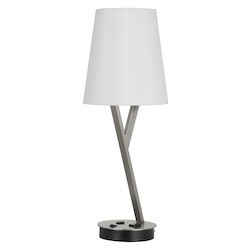 Each lamp comes with a stunning finish, such as black, white, pewter, silver, chrome, steel, antique nickel, antique brass, etc., to best suit your home decor. 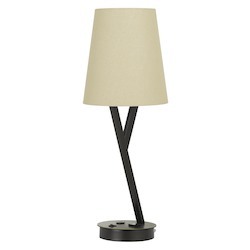 We Got Lites also offers a variety of designer desk lamps with different shade shapes, which include a bowl, drum, bell, dome, rectangle, square, oval, round, and much more, to match your interior decor. These lamps are also available in different eye-catching colors such as blue, black, green, orange, maroon, red, yellow and white. 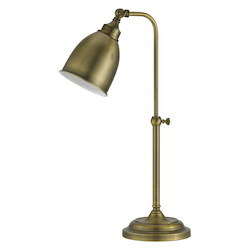 At We Got Lites, we have study lamps exclusively designed for kids from reputed brands. 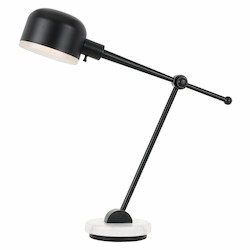 On wegotlites.com, you can find led desk lamps, bankers desk lamps, clip on desk lamp, desk lamp with outlet and wall mounted desk lamp which are all robust and durable. They are also available in numerous sleek shapes and diverse sizes. At We Got Lites, we try to ensure that you always have several desk light options for your home to chose from. That is why we have a huge assortment of desk lights for sale on wegotlites.com. We also want to ensure that when you buy one of our desk lights online, you are getting exactly what you need for you and your kids. 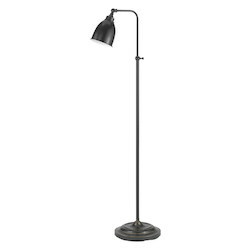 Whether you are buying a desk light with a bell shade, a standard or led desk light, a touch desk lamp, full spectrum desk lamp, or an adjustable desk light with a bowl shade, there is something for all your needs and rooms. 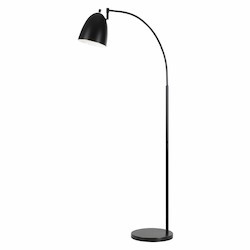 On wegotlites.com, there is a unique desk light for everyone and every style. As we stock desk lights in a range of styles and finishes, finding the right one that best fits your home decor is very easy. Our contemporary, sleek designs fit in with modern styles, whereas bold colors, fabric or enamel shades can be included into eclectic or art-deco styles. Our banker lamps and tiffany lamps fit well into the conventional schemes. On our site, you can also select lamps to contrast an underlying theme with a light that is obvious from the conventional decor. All our desk lights happen to be the primary option for architects, artists, studios and bookworms because our lights offer brilliant task illumination for sketching your next work of art, writing notes or devouring your preferred author’s latest novel. 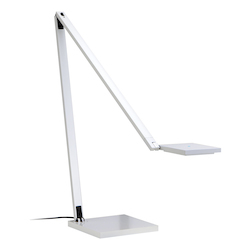 Most of our desk light styles feature a flexible arm, which ensures that you will not experience any glare from the bulbs and that the lighting is sufficiently bright to reduce the eyestrain. 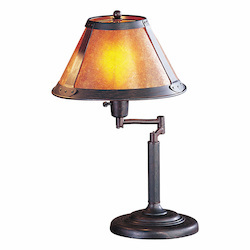 If you are seeking a classy design, our collection of swing-arm lamps and banker’s lamps are the ideal light option for you. 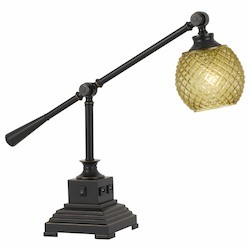 These two lamp styles have the exact amount of sass to change your workspace into a design-infused region. 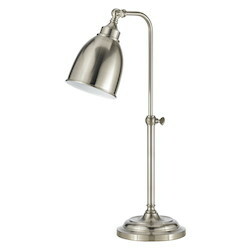 Protect your eyes by choosing a stylish and safe desk lamp from our vast collection of lights available on wegotlites.com. 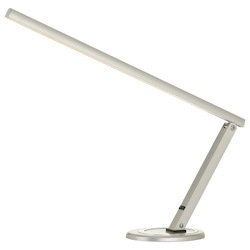 On wegotlites.com, you can buy your preferred desk light with your desired color temperatures, such as natural white, cool daylight and warm white. They are available in different lighting bulbs, such as LED bulbs and dimmable bulbs. All desk lights sold on our site come with a powerful, yet cool light emitting bulb that ranges in power from 0.5 watts to 25 watts. Other styles of the best LED lights for desk for sale on wegotlites.com include lighting desk lamps, natural light desk lamp, sunlight desk lamp, articulating desk lamp, teal desk lamp, computer desk lighting, book lights, V-lights, clamp on lights and strip lamps. 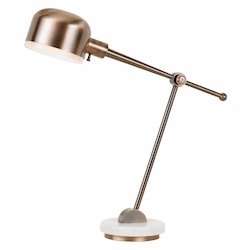 On wegotlites.com, you can buy your desk lights with attractive discounts that range from 10% to 80% according to the type of lamps you choose. On wegotlites.com, there are quite a lot of options available for desk lamps. You can buy your preferred type of desk lights at cheap rates that best fit your lighting needs, taste and home decor. 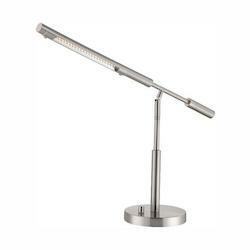 Below are some of the different options of desk lights available at We Got Lites. We Got Lites offers high-quality desk lamps with flexible necks that make it possible to vary the altitude of the light. 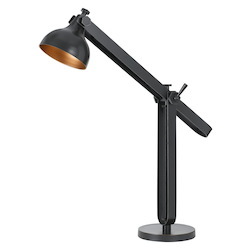 This helps you adjust the light beam from more focused to more scattered, according to your work space and your need. The flexible neck of these lights enables the light beam to be positioned where it is required. 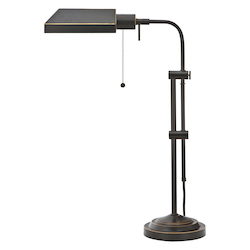 All our magnifying desk lamps come outfitted with an incorporated magnifier, which is handy for work that needs concentration on fine details. These lights are also usually outfitted with a flexible neck. 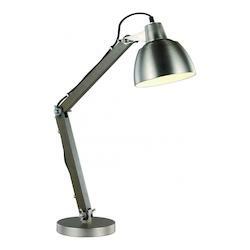 All clamp on desk lamps offered by We Got Lites are designed to allow you to make the most of the desk-top space. Instead of being positioned on a traditional base, these lights are clamped onto a nearby surface by the means of a clamp. These lights are often portable in design as well and they can be moved easily to other positions, according to your job. In this digital world, it is easy for a desktop computer to become muddled with cords and gadgets. 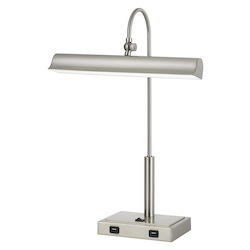 On wegotlites.com, you can buy multi-tasking desk lamps with several options such as iPod chargers, USB chargers, built-in outlets or even Smartphone chargers. 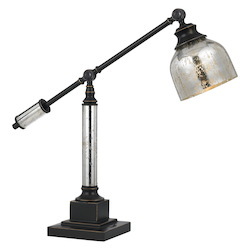 We Got Lites offers a variety of traditional desk lamps which can provide the option to deliver antique style and decor to your office or home. You can make your office or home feel as if it is a panorama out of the cinema by including rich glass shades and metal stems. 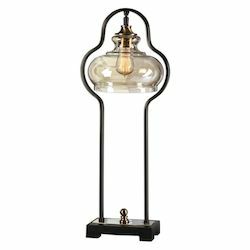 All our traditional desk lights are available with a pull chain and they are made out of thick glass, which releases a delicate and bright glow. 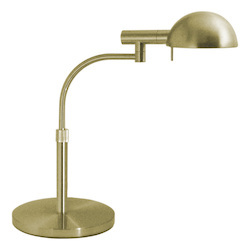 A traditional desk light, which is offered at We Got Lites, is the banker's light. 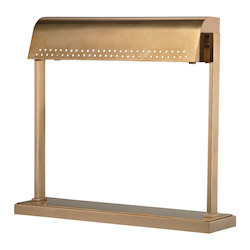 It has dual-bar brass supports and dons an attractive colored shade. 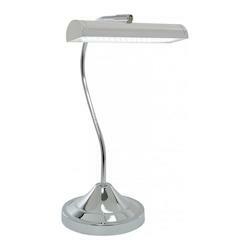 We also offer several types of desk lamps for offices, many of them with a slightly more contemporary design. 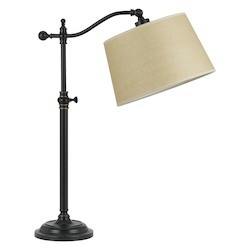 We also offer traditional lamps with gooseneck, swing-arm, lectern and piano models. 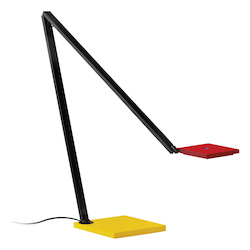 Some of our cool desk lights include foldable, cantilevered, tripod and flip-up designs, including retro and contemporary models of torchieres, shaded lamps and oil lamps. 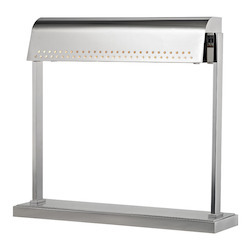 If you would like to offer your working space a clean, simple and innovative feel, then the modern desk lamps offered by We Got Lites is an ideal light option for you. 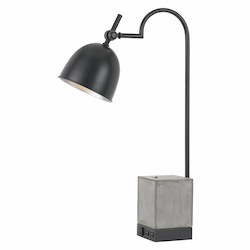 Our extensive collection of modern desk lamps are made from different textures, including recycled glass and steel. 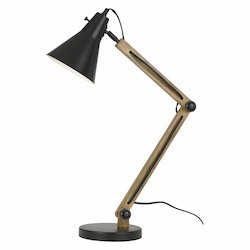 You can browse simple metallic desk lights or check out our uniquely designed LED desk lamps, which are power-efficient and appropriate for completing countless tasks. All of our Tiffany desk lamps are capable of offering an elegant look to your home or office and allows you to add your favorite color to your working space. The vivacious stained glass of these lamps is available in different patterns, including floral designs and geometric patterns. Our Tiffany desk lamps are designed to emit a soft, cool glow and they are designed to be an ideal lighting option for reading. We Got Lites also offers rustic desk lamps, which work well with rustic decor and they include natural elements, such as metal, wood, rope and tweed. If you take pleasure in the outdoors, then our rustic desk lamps look perfect alongside other wood and natural furniture. If you have a desk space or a home office and you would like to illuminate the space in an affordable and bright way, then you should opt for a LED desk lamp offered by We Got Lites. We offer numerous LED desk light deals and more lighting options, including fluorescent and incandescent lighting in retro and modern styles. All our desk led lights are purposely designed to cast a bright light downwards, magnifying the visibility on your working space. When you buy an LED desk lamp on wegotlites.com, you will get as much as five times the brightness when compared to other standard lamps. Moreover, they will consume only 50% of the power of other types of lights. 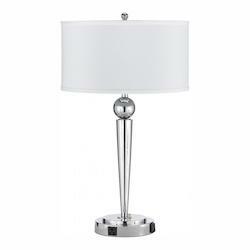 These lamps are available in both tall and short sizes, and you can get them in sleek designs as well. LED desk lamps offered by We Got Lites are extremely power efficient and they put out one-fifth of the heat emitted by halogen desk lamps. They are designed to have a maximum lifetime of 50,000 hours. 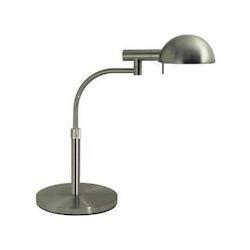 We also offer halogen desk lamps at affordable rates. These lights are another top lighting option available on wegotlites.com. These lights are designed to focus their light rays on the space around your desk, instead of in the main desk area. All desk lamps that come with halogen bulbs are power efficient and they are designed to offer a bright glow and reduce eyestrain and glare. All halogen desk lamps offered at We Got Lites have a minimum lifespan of 1000 hours and a maximum lifetime of 2000 hours. 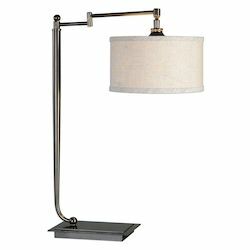 On wegotlites.com, you can also find clip on desk lamps, which are ideal for a desk space that is too small to hold standard lamp bases. With all the diverse types of clip on desk lamps available at We Got Lites, you can generate a light scheme to suit any room or space in your home. 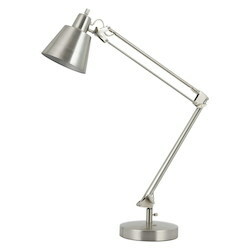 On wegotlites.com, there are also incandescent desk lamps, which are available for sale at the best prices around. 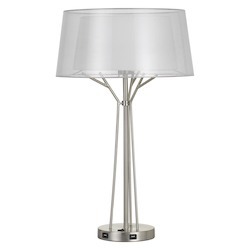 All these lamps are designed to offer a minimum amount of glare and they are capable of improving color definition. 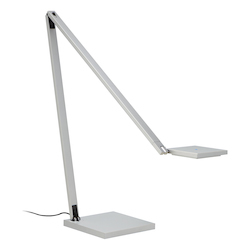 They are also designed to offer a uniform level of light to any workspace. The minimum lifespan of these lights is 200 working hours and the maximum lifespan is 1200 hours. At We Got Lites, we offer fluorescent desk lamps which are designed to offer a bright light to your work area. Although they are a bit costly, they have also have a longer lifespan. A classic fluorescent desk light has the maximum lifespan of 10,000 hours. 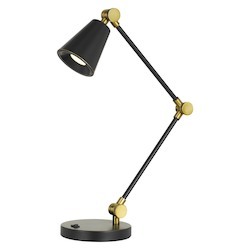 Keep your home, office or dorm room stylish and well lit with our high-quality desk lamps. On wegotlites.com, you can find options in multiple designs and sizes to best blend with other light fixtures an interior decor of your space. On our website, you can choose your preferred lights from a huge collection of ecologically-friendly and low-power desk light options, as well as LED desk lights for sale.